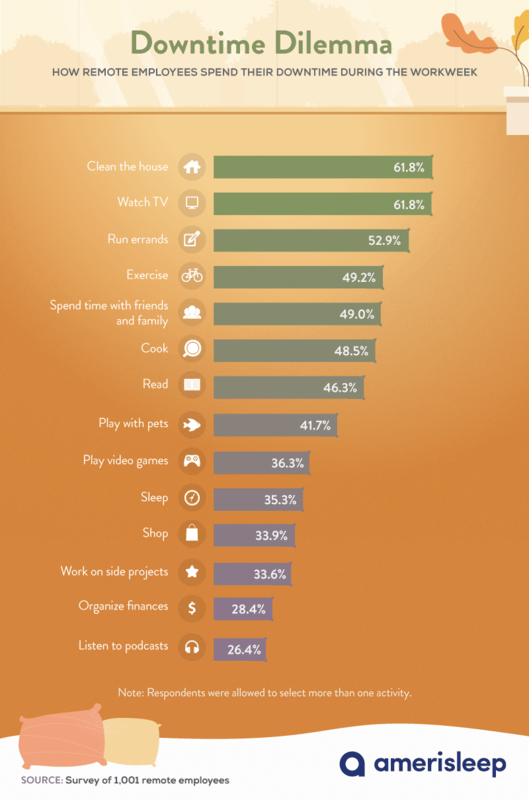 Working adults are increasingly working from home (WFH). With 43 percent of Americans working at least some of the time from home, this modern, alternative office has expanded the bandwidth of the professional community. While working from home offers comfort and convenience, we wanted to explore both its positive and negative implications. After breaking down the feedback of 1,001 people who worked full-time exclusively from home, we uncovered the trends and nuances of everything from sleep quality to job satisfaction and even the feelings of social isolation that come with working away from the office. According to the Centers for Disease Control and Prevention (CDC), 35 percent of American adults, regardless of where they work, are not getting the recommended hours of sleep every night. Just four percentage points more –39.5 percent exactly – of those who work from home are not getting the recommended hours. This gap isn’t exactly a world of difference for such a dramatic change in work environments, especially when one of them comes with a bed. It would appear that the time saved on the commute is not accounting for extra minutes or hours of sleep. The transportation industry fares the worst in terms of sleep quantity when working from home. This could be due, in part, to those in the transportation field working 45.7 hours per week, over 10 hours more per week than the average American. The remote sectors of the marketing and advertising industry reported the best sleep habits, with over 75 percent getting the doctor-recommended hours of sleep each night. Quality is better than quantity, or at least equal to it, when it comes to sleep. Specifically, the CDC claims your sleep quality is suboptimal if you feel less than rested when you wake up, if you wake up repeatedly throughout the night, or if you experience breathing issues like snoring or sleep apnea. Whatever the culprit, a lack of quality sleep is also a recurring problem for 35 percent of employees who work from home. On average, it takes them 25 minutes to fall asleep each night. Normally, it should take a person 10 to 20 minutes to fall asleep after getting in bed. 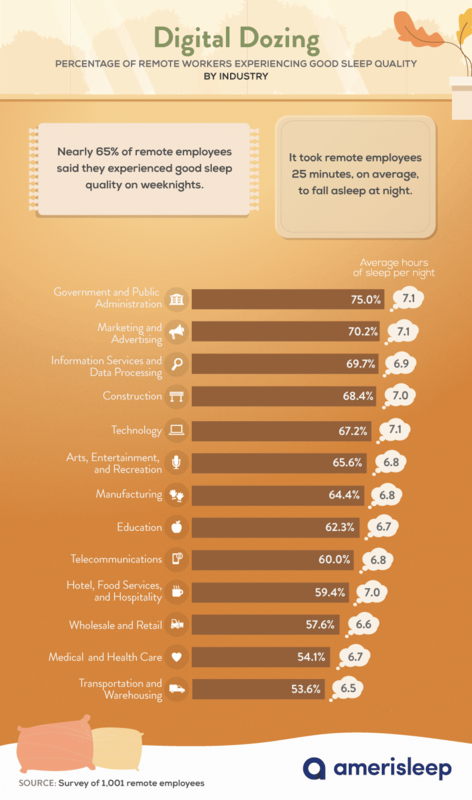 An industry-by-industry dissection reveals that government employees lead the pack, both in sleep quality and quantity. Remote employees in the transportation field fall to the bottom again, experiencing poor sleep quality and quantity more often than any other industry studied, averaging just 6.5 hours of sleep each night. Managing to work from home and sleep more than any other industry studied, marketers and techies garner over seven hours per night, on average. Those working from home for the government get just as much, matching the top remote sleepers at exactly 7.1 average hours of rest per night. Whether well-rested, most remote employees will not be commuting back to the office any time soon. In fact, 75 percent plan on working remotely for the rest of their career. Why? Perhaps it’s because they’re also 57 percent more likely to be satisfied with their job than those working from corporate offices or elsewhere. Ultimately, 80.5 percent of our remote respondents cited job satisfaction to be a reality for them. Although satisfaction likely correlates with the increased flexibility in schedule and location that working from home provides, remote work may not always be an option for more traditionally located employees. On the other hand, on-site job satisfaction can be improved with small changes like increased collaboration and more effective communication. Ultimately, all workers bear a degree of responsibility to make the best of their given situations. While the skeptical boss may associate a work-from-home request with a lazy day on the couch, a two-year Stanford study confirmed an "astonishing productivity boost" related to working from home. Moreover, 60 percent of the remote workers in our study cite moderate or high levels of stress throughout the workweek. Even with a couch, people who work from home are not exempt from deadlines, the pressure to perform, and the financial necessity of their labor. How do those who exclusively work from home evaluate their own productivity? To determine this correlation between productivity and working from home, we asked participants how many hours they work and compared that to how many hours they say they feel productive. Ultimately, nearly 26 percent of their time is reportedly wasted. With an average workweek of 47 hours, these workers confessed to an average of 12.2 hours of lost work time each week. Twelve weekly hours of wasted time only seems high, however, if you aren’t aware of just how unproductive the average corporate office is. Studies show that the average in-office employee is productive for less than three hours per eight-hour workday, totaling roughly 25 wasted hours per average workweek in the U.S. The telecommunications industry sticks most closely to the "waste not, want not" work ethic when working from home, wasting only 20.2 percent of an average 46-hour workweek. The education industry, on the other hand, wastes the most time (31 percent) per week when working from home. Regardless of industry, the average office worker is still facing a far less productive workweek from the cubicle. Away from the cubicle, the manufacturing industry admits to spending 13 hours per week doing remote work from their beds, making them the leaders in bedroom home offices. The manufacturing industry is followed by the telecommunications industry, which spends an average of 11 hours per week working from their beds. It would appear this added comfort is more helpful than distracting, however, as they report the least amount of unproductive work time compared with any other industry studied. 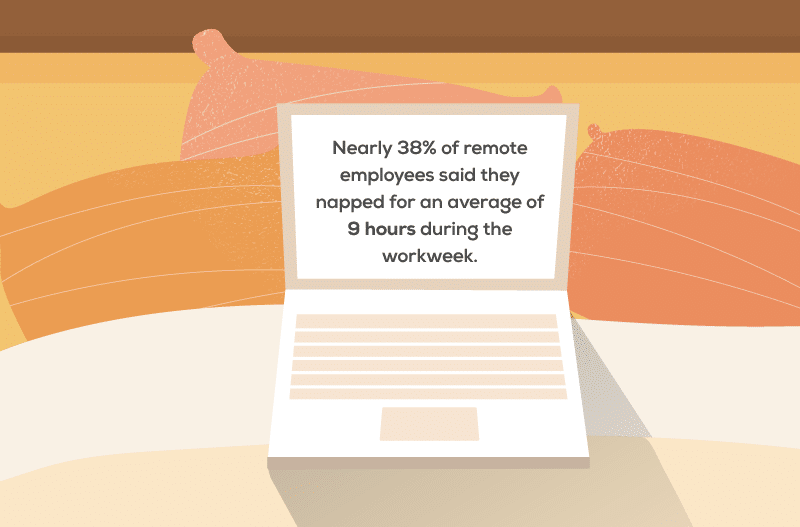 The fact that working remotely boosts productivity so significantly is even more impressive when you consider that more than 45 percent of our remote respondents work an average of 11 hours per week in their beds. 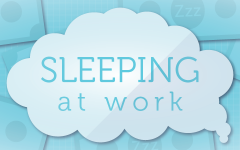 Moreover, 38 percent of these workers nap for nine hours, on average, during each workweek. Aside from working, what exactly are remote employees up to? Nearly 62 percent of the time, remote workers report that their downtime is used at least partially to clean their homes. Having a cleaner house leads to minimal distractions and increased focus, so cleaning their "office" space could set up more productive work. This downtime continues to blur the line between business and leisure, as 34 percent of remote workers dedicate a piece of this time to their side hustles. More than half of respondents use this time to catch up on errands as well. When they aren’t watching TV, playing video games, or shopping, 35 percent use their downtime for sleep. 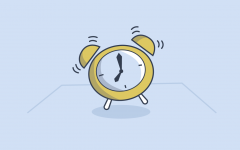 Of course, sleep is strongly correlated with a variety of both mental and health benefits, but it boosted the remote employee’s lifestyle in another crucial way: 49 percent of respondents shared their free time with friends and family. As it turns out, this socialization comes to play a crucial role in a healthy remote work-life balance. Continue reading to learn more. Although a work-life balance typically references activities outside of the office, people often forget it can be achieved within the office walls. A co-worker asking about your weekend or a group lunch can breathe life and balance into any work environment. This piece of the work-life balance puzzle, however, is entirely lost in an occupation that keeps you within your own home. How does "office" culture evolve in the home? Twenty-six percent of the time, those who work from home and receive 6.7 hours of sleep report feelings of social isolation. Feelings of loneliness can lead to various health issues, so remember to weigh your propensity for isolated feelings before taking the leap or continuing to work from home. Either way, our respondents prove that you can begin to abate these feelings simply by sleeping well. 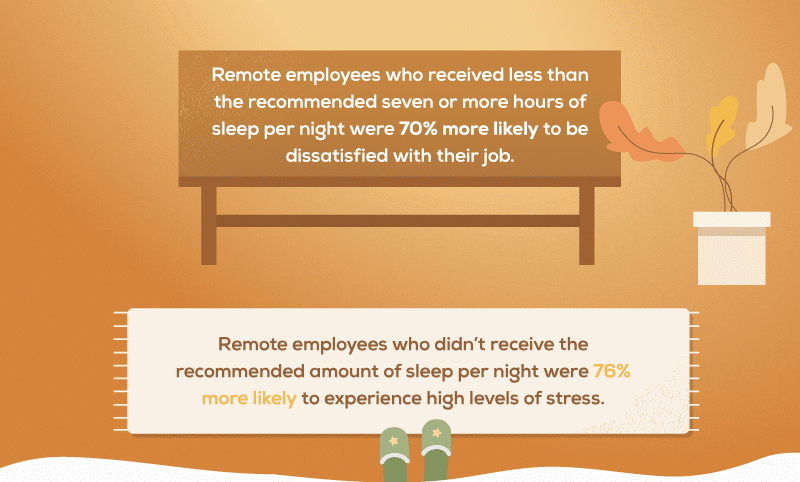 The remote employees in this study who felt the most isolated received the least amount of sleep. For those who received the most sleep and felt less isolated, perhaps a lack of lethargy promotes increased socialization. The many benefits of working from home – from flexibility to family time and even less gas usage –stack up rather quickly. With the finding that sleep quality and quantity essentially remain equal when working from home, the major downside of this lifestyle would appear to be a looming sense of social isolation. Considering this as a career option may ultimately be a question of just how much sleep you’re willing and able to get. 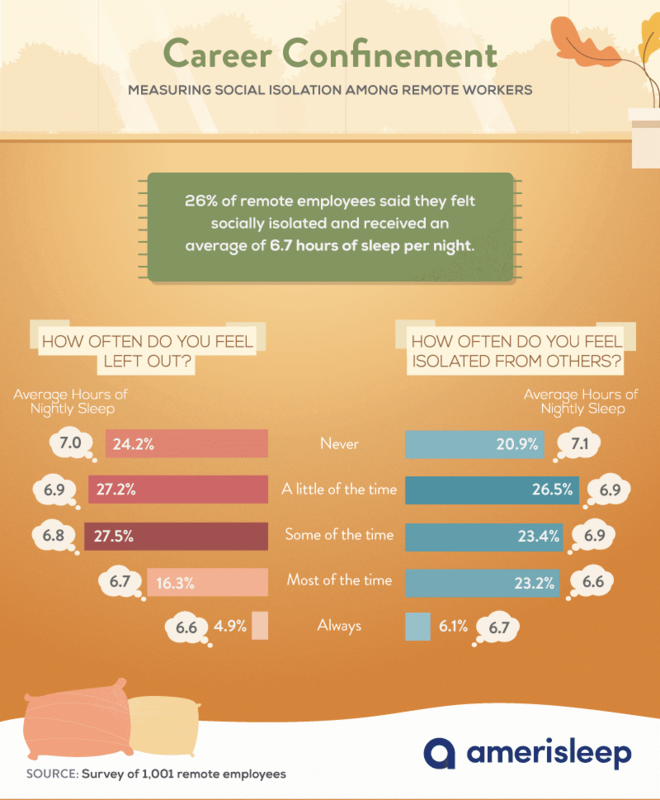 Remote employees who slept better could quell feelings of social isolation and loneliness. In turn, sleeping well can help you squeeze out more productive and effective hours while at work, in the home or out of it. Whether your career brings you to your home, the office, a school, or even behind the wheel of a car, remember to sleep well when the working day is done. At Amerisleep, we understand the impact good sleep quality has on your work performance. More than a decade of innovation has gone into engineering eco-friendly mattresses designed to provide revitalizing rest. Since we all live and work in different modalities and industries, we have developed a range of mattress models to suit your individual needs. 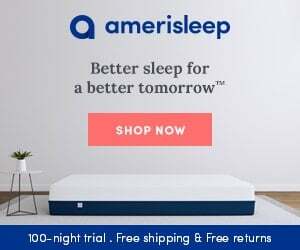 Visit us at Amerisleep.com to browse our selection of amazingly comfortable mattresses and get started with a 100-night, risk-free sleep trial. For this campaign, we conducted an online survey via Amazon’s Mechanical Turk targeting full-time remote employees. We collected responses from 1,001 remote workers asking about their daily sleep habits and job satisfaction. To guarantee that participants answered questions seriously, we included an attention-check question throughout the survey and disqualified those who answered it incorrectly. Likewise, respondents who entered inconsistent data were rejected from the study. Industries with insufficient sample sizes were excluded from industry-related breakdowns. Some questions and answers have been bucketed or reworded for clarity. 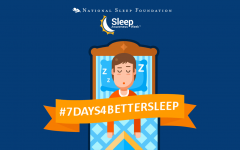 We pulled information from the Centers for Disease Control and Prevention’s (CDC) resource for basics about sleep as well as the percentage of U.S. adults not receiving the recommended hours of sleep each night. To calculate the difference in job satisfaction between remote and office workers, we compared the results from our study with findings from a survey covered by USA Today and commissioned by The Conference Board. Of the total 1,001 remote employees, 51.7 percent were male, 48.1 percent were female, and 0.2 percent identified as a gender not listed in our study. Respondents ranged in age from 19 to 69 with an average age of 35 and a standard deviation of 9.6. Sixty-five percent of participants identified as millennials, 28.4 percent were a part of Generation X, and 6.6 percent were baby boomers. Generation Z was excluded from our study due to insufficient responses. To measure social isolation among remote workers, we utilized a Validated Scale for Social Isolation from the American Psychological Association’s PsychTESTS database, which serves as a trusted resource for measurement and instrumentation tools. We determined the quality of sleep by asking respondents to rate their usual sleep quality using a five-point scale, with one being poor sleep quality and five being excellent sleep quality. The main limitation of this study is that the survey data rely on self-reporting, and no statistical testing was conducted on these findings. 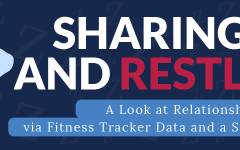 Want to reference some of our findings? This page is free to share for noncommercial purposes, as long as you link back to this page and its authors so that they can receive proper credit.